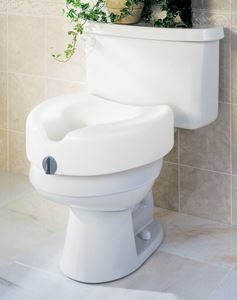 Lock Toilet Seat by Medline Canada is designed for those with difficulty in getting in and out of the toilet. Features a locking mechanism that is easy to use. Made up of a lightweight polypropylene resin that makes it easy to clean. Seat is raised upto 5" over a toiler seat.